Each year the start of the St. Patrick’s Day season begins with the Rockland County Emerald Ball and once again, the Rockland County Men’s and Ladies’ Ancient Order of Hibernians invite you to support this special event. 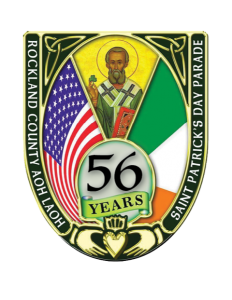 The Emerald Ball is a night to celebrate our Irish culture and traditions with great friends, food, music, and also serves as the primary fundraiser for the 56th Annual Rockland County AOH St. Patrick’s Day Parade. There are a variety of ways that you can support this year’s event including attending the Emerald Ball, sponsoring an ad in our journal, attending the Parade Day Breakfast, or making a direct donation. The cost to attend the Emerald Ball is $125 per person and the Parade Day Breakfast is $35 per person. Tickets to the Ball may be purchased below. Journal Ads may be purchased here.